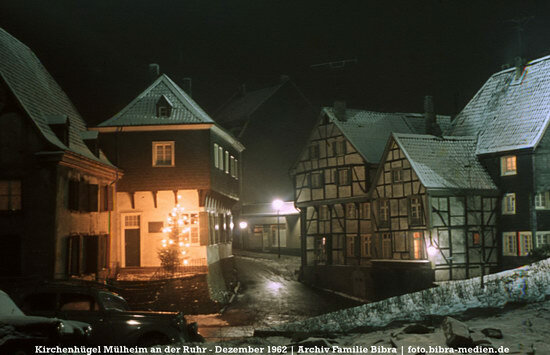 This is a very special photo from our archives, which has been used as a Christmas card lots of times in our family: it was originally taken by my mother Angela in 1962 on Mülheim’s Kirchenhügel, the church district in the inner city. She won a photography contest with it and today it is of real historical significance because this photo cannot be taken from this perspective anymore, although most of the houses still exist. There are many copies and prints of this photo, but a couple of years ago I found the original transparency again and carefully scanned and restored it – this is only the second time we’ve posted it on the web and now it’s also a tribute to my mother, who sadly passed away this year.